Les Tourterelles (The Turtledoves) has been converted from an old timber framed barn into a building reminiscent of the medieval houses of Troyes. The large oak beams have been exposed wherever possible as have the limestone walls giving the rooms a certain charm. The first floor is constructed from oak floorbaords. In the large sitting room/dining room, a wood burner nestles in the chimney place providing additional heat and ambience if you so desire. There is a separate, well equiped kitchen. The luxury main bedroom with an exposed stone wall has a king size bed and satellite TV along with ensuite bathroom with bath, shower, handbasin and toilet as well as a hairdryer. The second bedroom with double aspect windows has two single beds though is large enough to accommodate a third if requested. A large shower room is available. The third bedroom has french windows with a Juliette balcony and an ensuite shower room with toilet and handbasin. 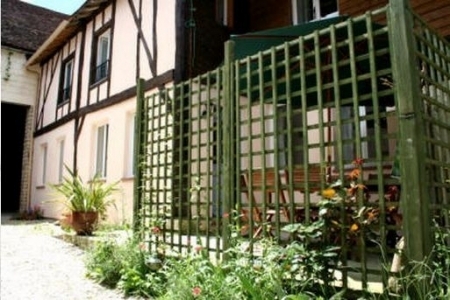 In front of the gite is a terrace with wood garden furniture and parasol. Privacy is offerred by the surrounding flower beds and trellis supporting climbing plants.